Annotation: Discusses the procedures used by surgeons in the past, describing the dangers involved in many of them, and how surgery has improved in modern times. This series has the look and appeal of popular websites: busy pages crowded with text boxes, color and black-and-white photos, and other informational asides. Graphic and often sensationalistic photos of diseased flesh, microscopic views of abnormal cells, and representations of unusual devices and outdated treatments are combined with sketchy information to create volumes better for browsing than research. Reading list. Glos., ind. 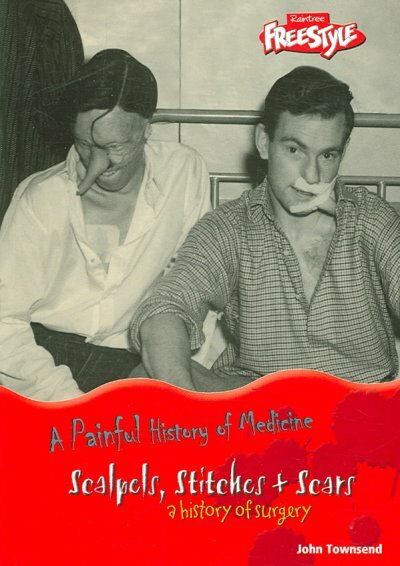 [Review covers these Painful History of Medicine titles: [cf2]Bedpans, Blood + Bandages[cf1], [cf2]Pills, Powders + Potions[cf1], [cf2]Pox, Pus + Plague[cf1], and [cf2]Scalpels, Stiches + Scars[cf1].] Copyright 2005 Horn Book Guide Reviews.